Why doesn’t every house have a lightning rod? You may know a bit about lightning rods. They were invented by Benjamin Franklin…they protect structures…but do you know what lightning rods do? Do you know if you have one on your home? These are reasonable things to know, especially if you live on the Southeast coast, which is much more prone to lightning strikes than the rest of the United States according to the National Lightning Detection Network (NLDN). 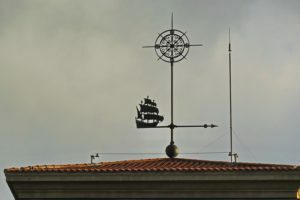 This post has a bit of everything about lightning rods, from how Ben Franklin proved that lightning was electricity to whether or not you should have a lightning rod installed in your home. It turns out lightning rods still exist and are effective, but many homes do not have them. Ben Franklin was curious about just about everything, and he was very intrigued by lightning. He was not the first scientist to note that lightning looked and acted a lot like electricity, but he was the first to prove it. This is the kite experiment with which many people are familiar. Patience was not Franklin’s strong point, and he couldn’t wait for a church steeple to be finished in order to attract electricity. So, he decided a kite was a better alternative to reach a lightning storm. He tied a key to the kite and insulated his string-holding hand (somewhat). When the kite was in the storm, the key attracted an electrical charge, Franklin could feel the signs of electricity, and his hypothesis was confirmed. Lightning was electricity. He later found that electricity travelling through blunt conductors had a crack or a snap, and pointed conductors were silent. This led him to believe that putting sharp points (lightning rods) at the top of buildings would minimize the effect of the electric lightning trying to reach the ground. Of course, that meant the rod would have to be grounded. There is much more to Ben Franklin and the lightning rod then we have time to cover here, but if you are interested in more, please see the Physics Today article located here. Lightning, or electricity, is searching for the quickest route to the ground. If it does not have an easy route, it may strike anywhere and seeks out things that are tall to find the fastest route to the ground. Why does this happen with lightning? During a lightning storm, there is an imbalance between the charge of the sky and the charge of the ground, so electricity is attracted to that imbalance (or rather lightning is a result of that attraction)…kind of like a battery. If lightning strikes something that is not a good conductor of electricity, it heats up and causes a fire. That is why a grounded lightning rod works…it provides a path of least resistance for electricity to travel to the Earth without damaging the home…or at least reducing the damage. Lightning rods do not attract lightning, but if lightning strikes the rod or very near the rod, it will choose to take the path of least resistance. That is why a single lightning rod may be inadequate for good protection. Lightning rods are not a thing of the past, and there are many installed on homes across the country. In fact, proper lightning protection systems have multiple lightning rods spread out across the top of the structure. You don’t see them because they aren’t the tall monstrosities that they once were. Most people won’t notice or recognize them because they are very inconspicuous. The Lightning Protection Institute (LPI) has a certification process for lightning protection system installers, and speaking to one will allow a person to find out the specifics about how to properly protect a home. Should You Have a Lightning Rod? Whether or not you have a lightning protections system installed on your home is a personal choice, and it is not required by law. The effects of a lightning strike can vary from electrocution to fires to the loss of electronics. A lightning protection system is not a guarantee that lightning will not damage your home. However, it will likely mitigate the chance of any major losses. Still, it is an investment, and if you live on the West coast in an average-height home, the risk is pretty low. Ultimately, the decision to have a lightning protections system depends on risk and worry. If you want every available protection for all natural disasters, then a lightning protection system is for you. If you live in Florida, then a lightning protection system is for you. The chances are slim, but should lightning strike your home, a lightning protection system with multiple lightning rods is going to offer some protection. However, lightning can strike anywhere, and one lightning rod will not accomplish what a total lightning protection system will.